Core analysis is done to define lithology. Core analysis can locate faults or fracture networks. Oriented core can give additional important information on anisotropy. Thermal conductivity can be measured from core samples. Core samples are obtained from drilling a well, typically using a synthetic diamond coated bit that has a hollow center so cylindrical rock samples (“core”) can be extracted. Core samples successfully recovered are visually inspected to determine rock type, mineralization, and fracture networks, then certain laboratory analyses may ensue to acquire detailed rock properties. "Core drilling is an exploration technique that has potential to identify the reservoir and determine where further drilling should take place. 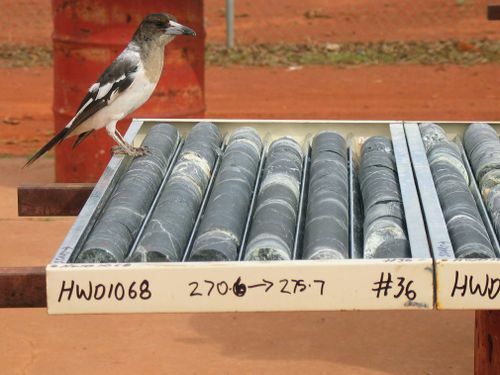 This drilling technique is also referred to as “slim-hole drilling.”'"`UNIQ--ref-00000001-QINU`"' The actual rock analysis begins with identifying general characteristics of the sample, then select samples are sent to labs for a more detailed investigation. This is a very common exploration technique to identify or “prove” a geothermal resource and costs can range widely. Costs typically depend on drilling conditions and depth of the well. [[File:Diamond_Core.jpg|thumb|500px|center|A box of rock core samples obtained from a diamond core drilling rig. Photo from , contributed under GNU licensing on June 5, 2006." cannot be used as a page name in this wiki. Core drilling is an exploration technique that has potential to identify the reservoir and determine where further drilling should take place. This drilling technique is also referred to as “slim-hole drilling.” The actual rock analysis begins with identifying general characteristics of the sample, then select samples are sent to labs for a more detailed investigation. This is a very common exploration technique to identify or “prove” a geothermal resource and costs can range widely. Costs typically depend on drilling conditions and depth of the well. A box of rock core samples obtained from a diamond core drilling rig. Photo from , contributed under GNU licensing on June 5, 2006. "Core analysis is a standard technique that is a major aspect of defining the geothermal resource at depth. An abundance of information about the geothermal resource is gathered from core analysis, which has the potential to physically “prove” the amount of thermal energy a given resource is able to produce." cannot be used as a page name in this wiki. Core analysis is a standard technique that is a major aspect of defining the geothermal resource at depth. An abundance of information about the geothermal resource is gathered from core analysis, which has the potential to physically “prove” the amount of thermal energy a given resource is able to produce. [[X-Ray Fluorescence (XRF)|X-Ray Fluorescence (XRF)" cannot be used as a page name in this wiki. In-situ stress magnitude and orientation. Drilling is conducted at a targeted location based on preliminary exploration techniques. The time it takes to complete a cored well depends on difficulty of drilling and depth of the well. A cored well cannot usually reach a depth much greater than 2.5 km. Preliminary core analysis can either be done at the drill site by a geologist, or after the well has been drilled and the core has been transported to a laboratory or a repository. Other common analysis techniques are thin section, X-Ray diffraction, and/or scanning electron microscope. The goal is to characterize the rock, both chemically and physically, to determine if the host rock has sufficient properties to sustain a geothermal power or heat utilization facility. Thin Section - Petrographic thin sections are very thin (~30 microns) slices of a rock mounted on a glass slide which can be viewed under a petrographic microscope to determine microscopic rock textures, mineral assemblages, provenance, porosity, and possibly reservoir quality. X-Ray Diffraction (XRD) - This technique is used to quantitatively characterize the mineralogical composition of a rock sample. There are various XRD machines and techniques, but typically a rock sample is crushed into a fine powder which is packed and mounted onto a stage that is analyzed by X-rays. The X-ray detector captures this information which gets plotted onto a diffractogram where characteristic peaks can be identified as specific minerals. Scanning Electron Microscope (SEM) - To investigate 3-D micro-morphology of a rock sample or fracture surface the SEM is a common technique to use. The SEM uses an electron beam to generate a 3-D image that can zoom from 20X to 20,000X (0.05 micron scale range). The SEM also provides semi-qualitative elemental composition of the material under investigation using an energy dispersive spectrometer (EDS). Electrical Resistivity - Core samples can be used to generate electrical impedance maps which can provide details about the heterogeneity and petrographic controls on electrical properties. Ultrasonic compressional and shear velocities - Velocities are sensitive to rock type and porosity, but there are also other variables that can influence velocity, such as textural and mineralogical variations. Reflectance Spectroscopy - A portable Analytical Spectral Device (ASD) spectrometer can be a fast way to analyze core at the well site and determine the general mineral composition of logged core. This technique is not as robust as thin section, XRD, or SEM, but can be a valuable tool to rapidly characterize a core sample and identify which sections need a more detailed analysis. This page was last modified on 15 October 2013, at 12:26.